MAGICAL WHIMSICAL TOPPERS that'll excite kids at any party or event! Our cupcake wrappers include double-sided printing with complementary patterns and sparkling borders. The unicorn horn toppers have been made slightly larger for a more impactful effect. Both toppers and wrappers are made from good quality glossy paper and are safe, non-toxic and biodegradable. Combined with the cupcake stand we offer a super good deal as the stand alone has a retail value fo $12. COMPLETE SET includes 24 cupcake wrappers, 24 cupcake toppers, and a matching handy reusable 3 tier reusable stand to put your bedazzled cupcakes and desserts on display - a great centrepiece for any occasion, including birthday parties, Halloween, Valentine's, baby showers, and more. 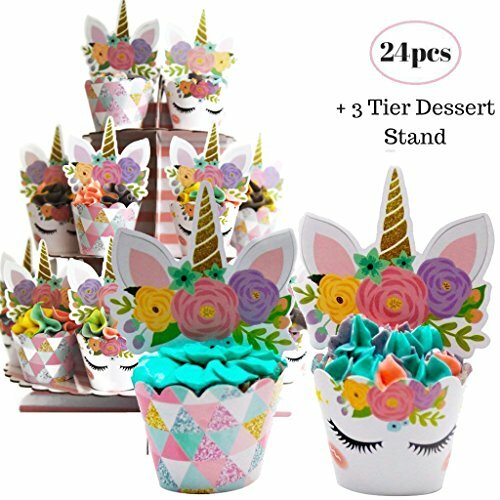 HOW TO USE - The cupcake topper and wrapper come in flat packaging, Simply decorate your cupcake sides and tops with our unicorn décor pieces. They are for decoration only and are non-edible. Please do not place them in the microwave or in the oven. Please note that these are bottomless wraps and not cups. SIZE - Wrappers easily adjust to two sizes for standard homemade and store-bought cupcakes. Two slots are available so that the wrappers may fit cupcakes of diameters 1.75 inches or 2 inches. Wrapper (larger adjustment): top diameter approx 3", bottom diameter approx 2", 2" in height; Wrapper (smaller adjustment): top diameter approx 3"(7.6 cm), bottom diameter approx 1.75", 2" in height; Topper: 3.1" in width, 3.75" in height. PURCHASE WITHOUT WORRIES - COCO & ELLA BRAND: Pair this party pack with other unicorn decorations and party supplies under our label. We take pride in creating unique designs for all your party decorating supply needs. are confident that you'll simply love our products. If you have any questions you can contact us at any time and we will make every effort to reply within 24 hours. We offer a full refund and money back guarantee if for any reason you are not satisfied with your purchase. View More In Cake & Cupcake Toppers. If you have any questions about this product by Coco & Ella, contact us by completing and submitting the form below. If you are looking for a specif part number, please include it with your message.